Discover why agreeing to get in touch with prospects later is costing you sales, and what you can do to create a sense of urgency among sales prospects. Meet Jack, a freshly-hired sales rep. As part of his training, Jack is asked to shadow a senior salesperson, Donna. He listens intently as Donna calls a referral she received from her professional network. Shortly after the conversation begins, the prospect says, "I'm glad you called, Donna. Yes, we've discussed doing something like this but we're working on several other initiatives right now. Can you please give me a call back in about 6 months?" Donna pauses for a split second, then just as she’s about to say something the prospect says, "Thanks again, Donna. I'll talk to you then," and the line is dead. Without even realizing it, Donna dips her chin and closes her eyes momentarily. Noticing Donna's frustration, newbie Jack says, "What's the problem? Isn't it a good thing that she's a potential buyer and she still wants you to get in touch with her when she's ready?" Donna remembers when she would have perceived the call with the same optimism as Jack, but years of sales prospecting experience have taught her otherwise. So the question becomes: how can I create a buying vision now? The single biggest reason sales reps don’t make quota is an inability to communicate value messages, according to results from the Sirius Decisions PMM Survey. 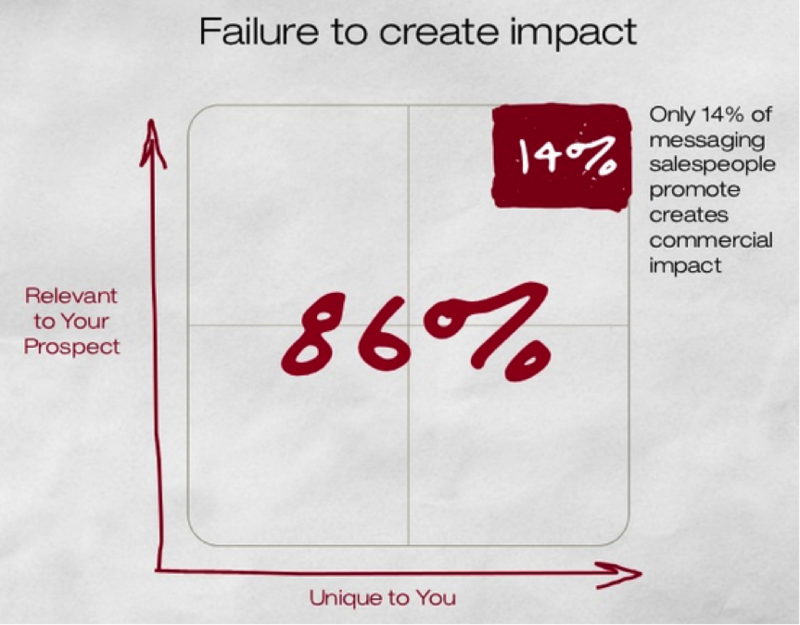 The messaging aspect of sales is critical, yet only 14% of messaging sales people promote creates commercial impact. The key to creating a buying vision is to sell the problem, not the product. When you sell the product, you’re not competing with your biggest competitor in most cases: the status quo. But when you sell the problem, you break free from the sales “bake off,” a process where sellers try to convince the potential buyer why their offerings are better. And when you’re the first sales rep to sell the “why change” instead of “why us,” you are the one who creates the buying vision, making it highly likely that you will come away with the sale. If you agree to get in touch later, you’re leaving an opening for a competitor to swoop in and create the buying vision. A list of specific threats, problems and missed opportunities that put each outcome at risk and need to be solved. Mrs. Prospect, Let’s suppose we aren’t able to address [Donna’s solution category] in six months, or even another year, what will happen to your [Executive-level outcome at risk] then? Regardless of which question or statement you use, the goal here is to get your prospect thinking about, and to create a conversation around, the executive-level outcome at risk. Now, you can begin to reveal the specific threats, problems and missed opportunities surrounding the outcome at risk in a way that aligns with the strengths of your solution. And of course we don’t always get an opportunity to create the buying vision during a conversation. In these instances, a well-thought, strategic InMail message can help you start this vital conversation with your prospect. Do you have stalled sales in your pipeline? 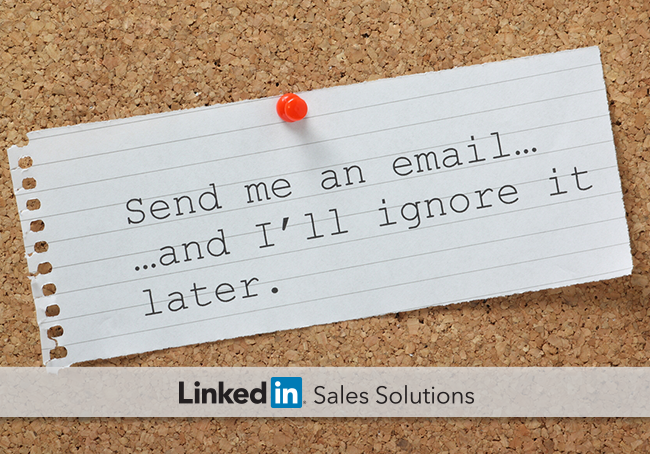 How can you create a sense of urgency with these prospects?